Last year I visited Italy for the very first time. When I close my eyes and take myself back there, my mind dreamily drifts to images of cobblestone streets, sidewalk cafes and, of course, the food – the glorious, glorious food. Simple rustic dishes, prepared fresh with care and full of natural flavours. These are the kinds of tactile memories you want to hang on to and only hope you can experience again. 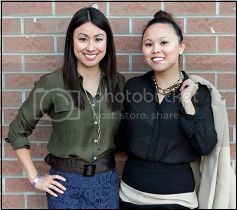 I was invited to attend an opening party for Levetto’s newest location at College and Dovercourt. 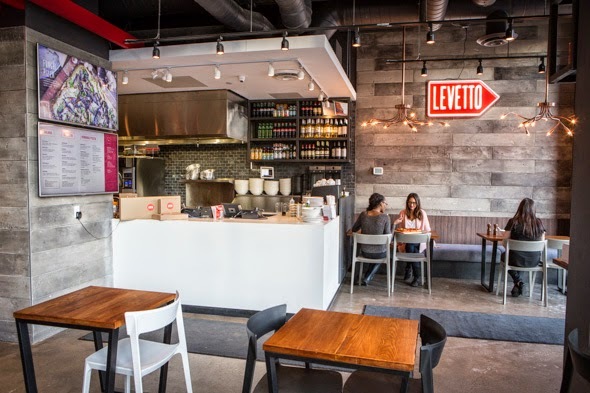 The concept at Levetto is simple – it serves fast casual Italian dishes, with a focus on “authentic Roman cuisine at fast-food prices”. Having been so spoiled in Italy, I cannot help but hold local Italian cuisine to that standard. 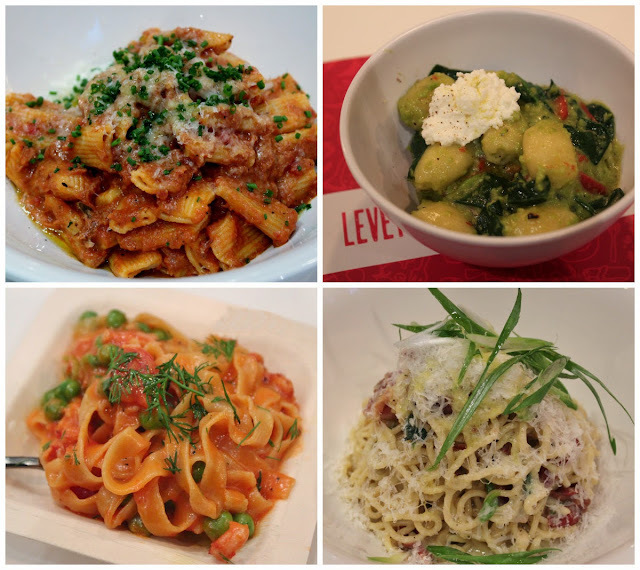 I was curious; would Levetto’s menu ignite my memory of the flavours, tastes and textures I experienced in Rome? The food did not disappoint! Generous portions made with heart; my taste buds couldn’t help but do their happy dance. Their pastas and pizza dough are made fresh onsite daily from scratch and all of their dishes are cooked to order. I believe great food should entertain a variety of senses. The aromas floating upwards from the plates took me to my happy place and each dish was as enjoyable to look at as they were to eat. Their menu consists of a selection of salads, pastas, pizzas and desserts with prices ranging from $8-13 for the salads and pastas and $7-31 for the pizzas (depending on the size ordered). Water makes up 85 percent of their pizza dough. The result? Ultra light and airy dough with a crust that has just a bit of crisp. 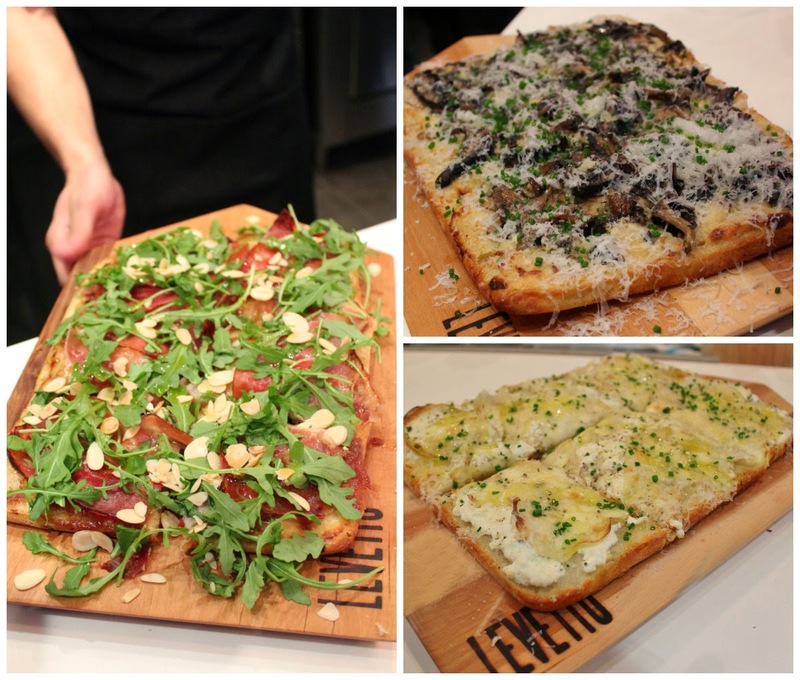 Smoked Proscuitto Pizza - speck, medjool date sauce, fresh arugula, Fior di Latte and toasted almond, Funghi pizza - portobello, oyster and cremini mushrooms, mascarpone and roasted garlic crema (take a moment to relish in the blissful fragrance of this pizza before devouring it! ), Patate Pizza - yukon gold potato, sliced green onion, rosemary, ricotta, white truffle oil and grana padano. Their pizzas are great, but the real standouts for me are the pastas. Cooked to perfection and beautifully plated, the swirling mounds of pastas are made with few ingredients and are simply delicious. The Pomodoro pasta was my favourite offering of the evening. An uncomplicated and satisfying dish of firm pasta, tomato sauce, garlic infused olive oil, basil and grana padano. I could easily order this again and again. Rigatoni – slow-braised beer ragu, grana padano and chive, Cavatelli – pea pesto, roasted red pepper, baby spinach, white truffle oil and ricotta (another great choice, if you like peas, you`ll love this pesto! ), Tagliatelle – grape tomato, sweet pea, dill and tomato butter sauce (try it with lobster for a touch of decadence), Carbonara – a classic Roman dish with smoked bacon, cracked black pepper, egg, scallion and grana padano. 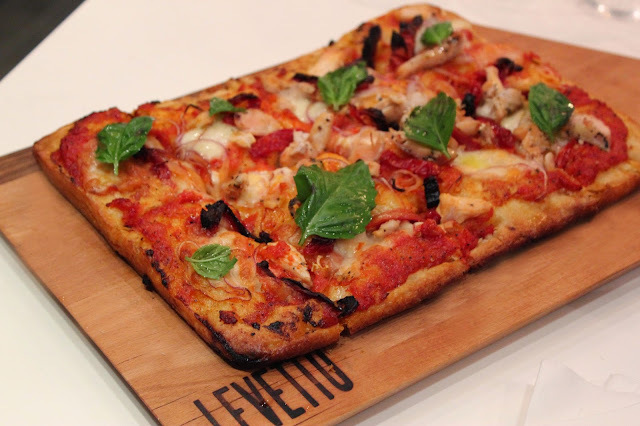 Levetto doesn’t cut any corners and proves that fast doesn’t mean compromising on taste or quality. Visit any one of their five locations (including Liberty Village, College St, Burlington, Vaughan, Waterloo & Baden) for a taste of Roma without having to splurge on a pricey plane ticket!